Are you interested in having straighter, more aesthetically pleasing, and healthier teeth? 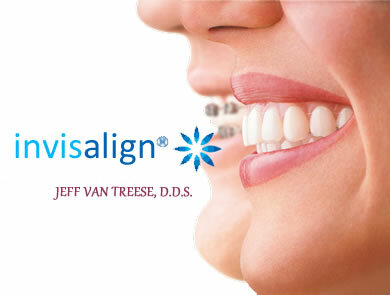 If so, you may be a candidate for Invisalign from Dr. Van Treese, DDS in Sidney, OH. You probably know what Invisalign is. It is a system of trays that works to correct your smile in a more sightly and comfortable way than traditional braces. Invisalign trays are worn successively over a period of time to slowly shift your teeth and correct the imperfections in your smile. As you could probably guess, traditional braces are in your mouth every hour of every day until your treatment is complete. This means that they limit what you can eat and drink. After all, you don’t want to eat something that will break your wires or brackets, or affect their ability to work properly. With Invisalign, you can simply take your trays out when you go to eat, eat whatever you want, and then replace your trays afterward. Dr. Van Treese strongly recommends brushing thoroughly after meals, if possible. Traditional braces fill your mouth with rubber bands, brackets, and wires. All of these things can poke and bother your cheeks, lips, and mouth. Invisalign does not require any metal and bands to be placed in your mouth, just a tray that is molded to fit over your teeth. This advantage is especially important to adults who want straighter teeth. Invisalign trays are translucent and are very hard to see during every day life. This means that, as you go about your day, people will hardly be able to tell, if at all, that you are wearing an Invisalign tray. Sadly, the same cannot be said about traditional braces! Think about everything that is put into your mouth when you receive traditional braces. Wires, bands, brackets, and more. What do all of these things do? They make it much more difficult to brush and floss your teeth in the correct manner. Additionally, these objects offer germs and bacteria a place to harbor and build up on your teeth. This could be bad news for you, as these germs and bacteria may start causing oral health issues. Do you have an interest in receiving Invisalign treatment? If you are interested in Invisalign, you should know that treatment is not as expensive as many people make it out to be. Typically, Invisalign treatment will not be much more expensive, if more expensive at all, than traditional braces. If you have any additional questions, or would like to receive a consultation, feel free to contact us today to schedule an appointment to see Dr. Van Treese.